Lounge, kitchen, twin bedroom, bathroom. 2 double bedrooms (opening onto roof terrace), and family bathroom. The Air Conditioned living room has sofas, WiFi Internet, DVD player, dining area and ornamental fire place. If additional beds are required there is 2 sofa beds. Villa Dimitris can sleep up to 8 people. The pool is set within well tended, lush gardens. It is completely private and secluded with no nearby neighbours overlooking. The roof terrace overlooks the pool and has wonderful panoramic views down to Souda Bay. The area outside is really great, the garden, Pool etc, really perfect! And the cleaning service of the pool and the house during the two weeks also! The villa was a perfect base for our first visit to Crete. We particularly enjoyed the garden and the pool . The upstairs terrace provided a beautiful view of the surrounding area especially at sunset. Super great nice family home. It was a great plesure to stay there! Top quality villa. Fully equipped and well maintained. 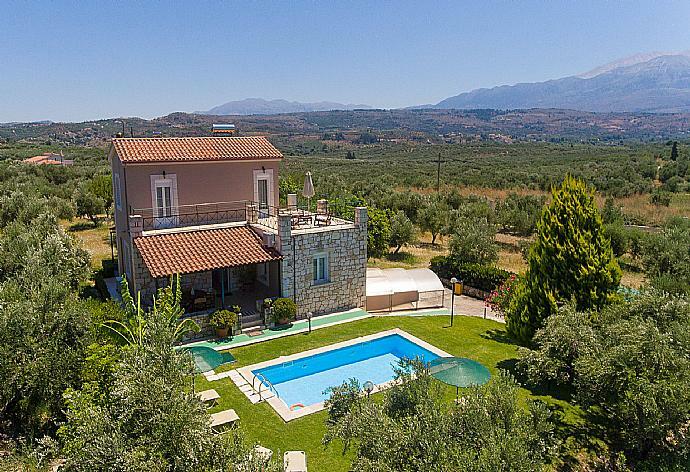 The villa is set in countryside surrounded by olive groves with mountains to one side and views of the sea on the other and is very private.. There is an excellent sitting area on top with plenty of room for 6 people to enjoy a gin and tonic in the evening whilst looking out to the sea in the distance. It is of a very high standard. Well maintained and clean, and fully equipped. The pool is cleaned at least twice a week and there is a complete change of bed linen and towels half way through. You will need a car. The nearest supermarket is 2 mins drive away and you can get everything you would want there. 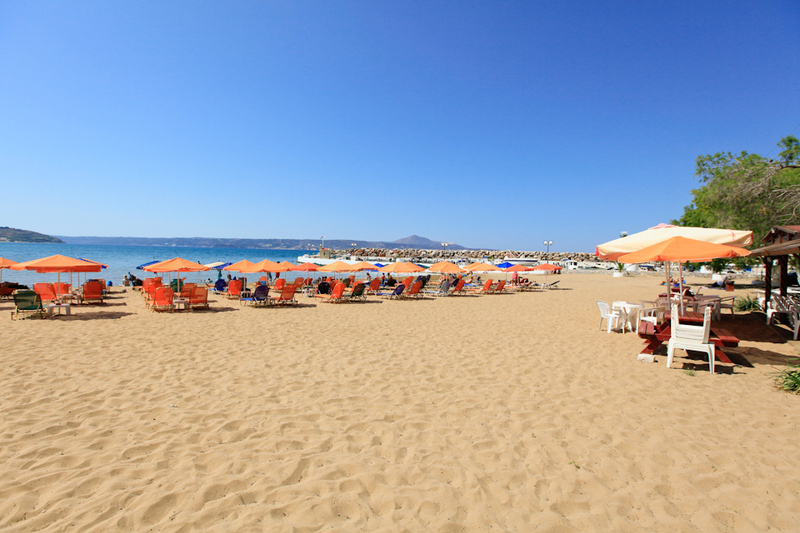 The nearest and best beach is just across the road from the supermarket and there are a nice mix of sunbeds and clear stretches of sand with a couple of beach bar/restaurants there also. Kalyves has lots of restaurants and is about 2 mins drive. Wonderful place to stay.Finally I would like to mention Agni Travel who are one of the best villa booking companies I ever dealt with. We have used many villa rental companies in our time but Agni are one of the best. The villa was to a very high standard clean well maintained and fully equipped. Agni were very efficient and professional throughout. Highly recommended. The villa is better than the description. The Villa and its location enabled us to have a superb holiday. One query raised with Agni Team prior to departure was dealt with in a good customer care manner. Wonderful house in a magnificent field of olive trees, we loved it! The people who take care of the house were very polite and discreet. A wonderful secluded villa set among olive groves. Accommodation is of a very high standard, pool is fantastic. If you stay here, I would say that having a car is essential. Maid service was excellent and pool was cleaned on regular basis, would thoroughly recommend this villa to anyone. It was a great stay. The house was really great the service was great. You will find peace and relaxation in the house. We will definitely go back to Crete and rent the house. Relaxing Holidays no problems at all with booking and the reliable organization. We enjoyed our stay. We had a fabulous time - the villa the region .... everything was just what we had read about and hoped for. From initially booking the holiday right through to the end we found the Agni Travel team to be really helpful and that certainly make the holiday stress free. We were also very impressed by the services they recommended - one of our party required emergency dental treatment and the dentist listed by Agni Travel was superb so thank you very much. A lovely villa in a secluded location but within easy reach of Kalyves. Wonderful stay - Maria and her sons were great. They arranged for groceries on our arrival and Maria made us some homemade pastries - they were lovely people. Support from Agni Travel and Eos Travel was great by text too - very quick response. Villa was peaceful - it was a really relaxing holiday - thank you. Lovely area nice quiet position yet fairly close and within walking distance to attractive coastal village of Kalives. Villa was just as we hoped and was well equiped and very comfortable. We all enjoyed our first of hopefully many holidays in Crete. The media have been making a big thing of the problems with the Greek economy and some people i think have been put off travelling to greece on holiday. I cannot stress how wrong they are the Greek people we met were incredibly friendly without exception and we felt extremely welcome where ever we went. There was absolutely no sign of problems or issues with banks credit cards etc. Greece needs tourism and it welcomes it with both arms. We would like to come to Villa Dimitris again :-) The house was very nice, belays in a very beautiful area. The service was good, if anything was needed we only had to say what it was. We had a fabulous holiday in Villa Dimitris the situation of the villa is idyllic and very peaceful. The natural shade provided by the surrounding trees was appreciated as temperatures rose during the day. The service we received from Agni travel team was excellent and we would certainly book another villaholiday with them. The information in the brochure was very accurate and would be hard to improve on.Everything was as we expected. We had a fabulous holiday in a wonderful setting. We have used Agni Travel 3 times now and find your service excellent. We had an excellent holiday at Villa Dimitris. The property and surrounds were excellent the living space very good and the water milk juice and biscuits on arrival were a welcome touch. And, although we had to contact the team regarding hot water and lack of water pressure the response was prompt. We thought the villa was in a great location. What we liked most was the view, the privacy and the level of comfort. We had a fabulous time. Thank you so much. The villa was perfect and just what we wanted. The pool is a real asset and was cleaned 3 times during the week. The clean linen half way through the week and the air conditioning were also a bonus. The villa was lovely, the owner was friendly. Overall we were pleased with the property and its location. Kalyves is a pretty coastal village with a wide selection of shops, tavernas and bars including a cooper's workshop. The highlight though, is the beautiful sandy beachfront and harbour. The beach has been awarded a 'Blue' flag denoting its clean state and safe water. Kalyves has a friendly atmosphere and is perfect for children. Villa Dimitris was booked 5 days ago!